Thousands of people in the northern hemisphere have witnessed a spectacular light show of shooting stars, known as the Perseid meteor shower. The annual event coincided with a new Moon, providing stargazers with the best viewing conditions for years. The shower lasts about two weeks, but reached its peak overnight on Sunday. It was most apparent in the north-east part of the sky near the Perseus constellation - prime viewing locations were Western Europe and North America. Dr Robert Massey from the UK's Royal Astronomical Society said that as many as 100 meteors an hour would have been visible where the sky was clearest and darkest. The annual Perseid showers are caused by small bits of debris, many no bigger than a grain of sand, that enter the Earth's atmosphere when our orbit passes through the tail of the Swift-Tuttle comet. These particles travel at very high speeds, reaching up to 50km per second (32 miles per second), and burn up in the atmosphere. This causes the air around them to get extremely hot, which produces the visible streak of light. David Hughes, professor of astronomy at the University of Sheffield said the particles typically burned up at 97 to 193km (60 to 120 miles) above the Earth's surface. "We should have been able to see these things - I'm sure - for millennia. 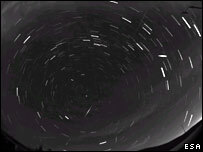 The first record of these is about 1,000 years ago," Professor Hughes told the BBC. 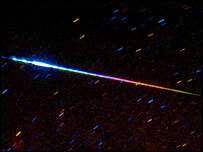 The Perseids were traditionally known as the "tears of St Lawrence" because they often appeared around the saint's feast day. "It's a spectacular phenomenon that everyone can enjoy. The great thing is that you don't need any equipment apart from your eyes," Dr Massey said. "It's a laid back form of astronomy. You can go outside, look up at the sky and enjoy it." As an added bonus, watchers should have been able to see Mars, which was set to be in view as a bright red dot in the eastern sky after midnight.